Closeouts At JCK 2016 And the New JIS Exchange (June 3-6, 2016)! It's that time of year! We must sell more to buy more at auctions. All items in stock marked down to sell. 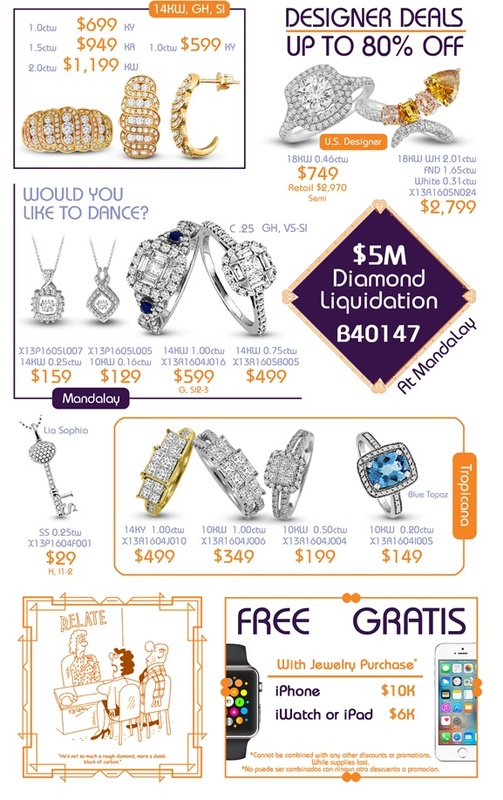 Visit our website for a sneak peak at our JCK 2010 Flyer. Every day it seems we hear about another jewelry store closing or in bankruptcy. Jules R. Schubot in Troy, Michigan; Standt’s in Muncie, Indiana; Carrol’s Jewelers in Coral Gables, Florida; and Mednikow’s branch in Atlanta are just a few of the big-name independents recently announcing they are closing. Leo Robbins & Sons in Philadelphia is being forced into bankruptcy. And the Finlay going out of business sale is going on across the country. The true value of diamonds has been dropping for months. Everyone hears about the economy tanking, the mortgage crisis, imminent auto manufacturer bankruptcies, factories closing down, and more. Finally we have a week for Jewelry in New York. Mayor Bloomberg will be issuing a proclamation that April 20-26th will be considered “Sparkle Week.” Department stores, jewelry retailers, and others are expected to promote aggressively and help build this into a major event. Robbins brothers filed chapter 11 today. It is expected that they will be split into two parts, each sold off. Consensus Advisers will be financial adviser to the creditors. Another one down. There has to be a record in there somewhere.